A bank money market account protects principal, is very liquid, and earns taxable interest. 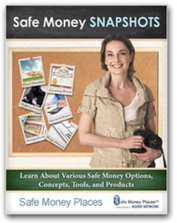 Money market accounts may often be opened for as little as $100 (although some banks require $500 or $1000). Yields are typically higher than those paid on bank savings accounts and lower than rates realized on certificates of deposit, but at times, money market rates have been higher than short-term CD rates. They are extremely liquid; you can make up to six withdrawals and write up to three checks a months (a penalty is usually charged when you write too many checks). Bank money market accounts are FDIC insured and subject to their limits. This discussion is limited to bank money market accounts. Mutual funds also offer money market accounts called money market funds and they have an excellent record of safety, but this site does not discuss the merits of securities, which would include mutual fund money markets.